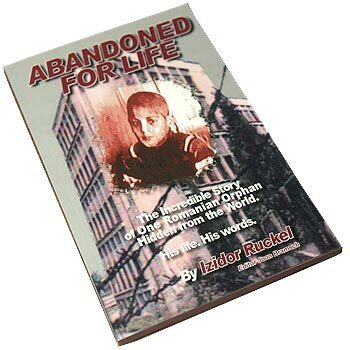 Abandoned for Life recounts in detail the first eleven years of Izidor Ruckel’s life as he struggled to survive in one of Romania’s most horrific orphanages. At the Home Hospital for Irrecoverable Children, Izidor and 500 other disabled children endured extreme abuse, shoved down moldy scraps of food, and spent their days locked in an empty, concrete room. The book follows his escape through adoption, his initially smooth transition, and his tragic rejection of his new family. Izidor finally finds hope and peace when he reaches out to God for emotional healing and is led to become a crusader for the orphans left behind. I shared my story so that other adoptees and their families can know they are not alone in what they’ve gone through. I may not save the world, but if I can help one life at a time, it’s worth it. Deeply insightful and sincere, Izidor has opened the door into a world that very few people ever thought existed - the truth about a orphan's life. One can only count their blessings, reading through the words that he poured out of his heart while traveling back memory lane. What an amazing individual and great example for all of us … a role model for all the children left behind. I highly recommend it to anyone who wants to know more about adoption, read about a human being's inner power to survive & thrive and to be part of a larger mission to help Romanian orphans. Thank you for sharing your mission with the world, Izidor! Reading Izidor’s book has given me a true picture of what it was like to be a child in a Romanian orphanage. Only someone who has lived through this can truly explain what it was like. Izidor did an excellent job explaining what he was feeling from a child's perspective. As an adoptive parent, it gave me a better understanding of what my child may have experienced. Throughout the book I could see the great strength Izidor has and the hope he never let go. Anyone who questions if international adoptions should be reopened needs to read this book. Izidor is an inspiration who deeply cares about children's rights, and he is a great example of what is possible for someone who believes they can make a difference for others. Ruckel provides the reader with a modern history of Romania from the Communist era to the Ceausescu regime which directly led to the abandonment of thousands of children nationwide. Although Ruckel’s story highlights the horrors of orphanage life, the reader will find it hard to put this book down as the story features Ruckel’s American adoption, his return to Romania to reunite with his Romanian birth family, as well as his quest to improve living conditions for his peers left behind in institutions throughout his home country. Given Our Chance is a two-time award winning documentary about Romanian adoption. Producer Izidor Ruckel and director/producer Alex King, both Romanian adoptees, share their stories of how international adoption “gave them a chance” at a new life. Several adoptive families are interviewed to discuss how adoption has impacted their lives. The film also presents the story of Janice Tomlin, the ABC News 20/20 producer who created a news series chronicling the Romanian orphan dilemma for over a decade and whose passion led to adopting two Romanian children herself. The producers hope their efforts will encourage Romania to re-open its doors to international adoption. If God could rescue me – an orphan once considered not worthy enough to potty train, let alone educate – to become an athlete, an author, and a film producer, then what do you think it could be like for others who are given a chance in life? Alex and Izidor, Thank you for an insightful, educational, genuine, honest, and touching look at your lives and those of others. Not only was the movie so well put together and the speakers well chosen, but I felt so inspired - to know more, to do more, to help more. Great work - thank you both. Bravo! Bravo!! BRAVO!!! What a FABULOUS job you all did!!! I had tears in my eyes and chills all over the entire time. You are both an inspiration to all who know you. Thank you for sharing your stories and giving of yourselves. I know you are going to touch many lives and inspire many folks through these efforts. Just watched your new video Given Our Chance. What a fantastic job the video does of explaining the challenges faced by both Romanian adoptees and adoptive parents. It brings to life what you wrote in your autobiography. If more people worked as hard as you do on behalf of orphans everywhere, so many children would not suffer anymore. Great job Izidor and Alex! 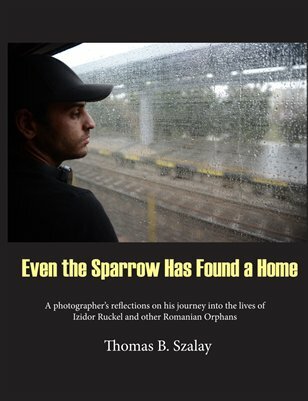 Even the Sparrow Has Found a Home is a 136-page documentary photography book by Tom Szalay. In this visual essay, Tom presents the story of Izidor Ruckel and his orphanage friends who were freed from a life of hell in a notorious Romanian institution. The photos begin in 1991 when Izidor was adopted by an American family and end in 2015 when Tom revisited several children - now young adults - and accompanied Izidor back to visit the haunted place where they all were raised. The images reveal how the human spirit, once caged and abused, fares after twenty years: some to great freedom, others still bound by scars. Tom chronicled my life in pictures for almost two years when I first came to the United States in 1991. His work twenty-four years later to update the photo story on my friends and I shows how his passion for orphans remains strong. He is an amazing photographer and a trustworthy friend. As shocking as [Szalay's] [original] photos were, the story inevitably faded from American headlines. But Szalay revisited several of those "unsalvageables" who were mercifully adopted by American families. However, Szalay doesn't spin reality into a Cinderella story. His photos and descriptions reveal lingering emotional and physical scars. Tom's book brought back so many memories for me. To see pictures of my friends and me so young and now as grown ups - Wow! It's just beautiful what he has done. When Tom came to see me after so long, he looked different, but he was still the same sweet man. His love for us comes through in his pictures. Tom Szalay's work allowed me to really see Romanian orphans through Izidor's eyes for the first time. Very vivid work. Amazingly sobering. The caption with Marin's photo at his 'dinner table'... the awfulness of the world sometimes. So painful. Though I'm sorry such terrible subject matter exists in this world, I am also glad Tom documented it.